This Chick fil a is located just off 195 at exit 160. The area is tricky to get into, even more so when it is pouring rain. The store was pretty busy; however the staff was handling it very well. I had to wait about 10 minutes for my order. The cashier was very nice. The store was busy, but someone should have been assigned to cleanup duty. Many of the tables were dirty and the floor behind the cashier was awful! The food was great! I would have to say it is in the top 3 of all the Chick fil a’s I have ever visited as far as food quality. Clean the place up a bit even during rush hour! I would stop here again. First time at this location in Florence, SC. But the food and service is the same high quality as all other locations. Easy on and off I-95. SO HAPPY THEY REOPENED!! BIGGER AND BETTER!!! I travel weekly to Florence for business and stay in the hotels across the street. This Chick-Fil-A NEVER disappoints. My food is almost always too hot to eat its so fresh! The new building on the site of the previous Chic-fil-a is a lovely facility inside and out. It is on par with other newer Chic-fil-a's that I have visited. The quality of the food is good, and this chain always delivers a superior fast food product. The issue with this location is that it takes such a long time to order and receive your food. The lines are often ridiculous inside, and the drive-through is always packed. I recently went by around 7:30 am and chose to order inside because of the length of the drive-through line. It appeared that they were understaffed for the number of customers that were there. 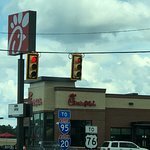 This location is closer to my house, but I often drive across town to the other Chic-fil-a location in Florence because the service is so much faster. Great food but be prepared to wait a while. 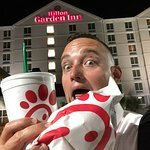 Been to Chick-fil-A? Share your experiences!